The Vetters grew up in the idyllic setting of Bass Lake in Munson Township, a community that borders Chardon, Ohio, the heart of Northeast Ohio’s “snow belt.” When John Vetter and Marie Chavez married in 1954, they purchased a tiny cottage which also became home to the six rambunctious children they had over the next eight years: oldest son Greg, twins Debbie and Diane, Janis, Mark, and youngest Juanita. In the 1960s, the Vetters were a vibrant, fun-loving family. However, their blissful plans for the future took a dramatic turn when Marie unexpectedly became ill. After her heartbreaking death at the age of 42, John was left to raise the six children ages 7 to 14 on his own. With Social Services looking to split up the family, John took a low-wage job at a local gas station so he could be close to home. With no extended family on which to rely, the Vetter’s endured tumultuous upheaval and financial struggle. Fortunately, the foresight of the girls’ physical education teacher and the vision of a dedicated track coach drastically changed the family’s trajectory. And John realized that his children’s athletic gifts provided a way to hold the family together. Through a combination of cross country, track & field, and wresting talents, the Vetters achieved extraordinary success in the 1970s and 80s. All told, they earned a combined total of 16 State Championship awards, 35 All American awards, 25 National Championship awards, 10 American records, and 3 world record holders. 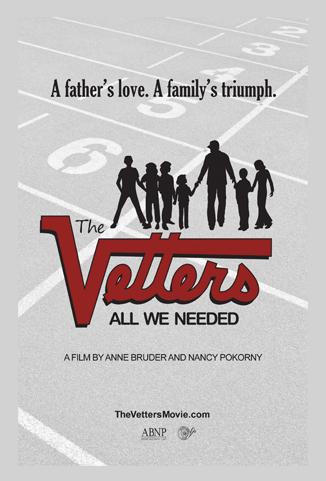 From their stunning athletic talent, to the unanticipated college dreams afforded by the passage of Title IX, to the resilient connection the siblings shared, THE VETTERS: ALL WE NEEDED draws viewers into the lives of a unique family with a touching, compelling story. Edited in a nonlinear narrative unlike most documentaries, THE VETTERS offers a textured style of filmmaking. Vintage 8mm film footage, family photos, archival news articles, and a dynamic musical score, including the original theme song “My Father’s Eyes Were Watching,” are woven together to create a stirring viewing experience. This deeply uplifting journey of fatherly devotion, familial love, perseverance, and triumph will linger in viewers’ hearts. Anne Bruder is co-owner of Wagon Wheel Films, a video production and independent filmmaking small business in Willoughby, Ohio. Anne received a Bachelor of Arts degree from Notre Dame College of Ohio, majoring in Communications. She has held marketing, communications and project management positions related to higher education, community development, corporate sales and printing/publishing. Anne has acted in and directed numerous plays at Notre Dame College, such as 12 Angry Women, Neil Simon’s The Odd Couple, and several original productions. 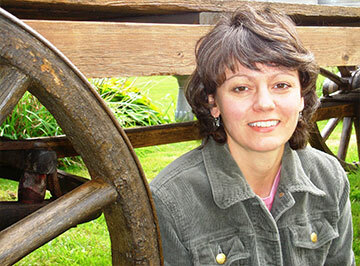 In 2006, Anne co-created Wagon Wheel Films, which is named for a 19th century farm wagon passed down for three generations. She and partner Nancy Pokorny chose the Wagon Wheel name because it connotes simplicity, hard work, naturalness, and a sense of journey. She appreciates the imagery of the old wagon wheels’ resemblance to old film reels—the former creating stories as they roll and the latter telling those stories. In 2007, Wagon Wheel Films released a 30-minute independent documentary about the history of downtown Willoughby, Ohio entitled Willoughby’s Legend & Legacy. 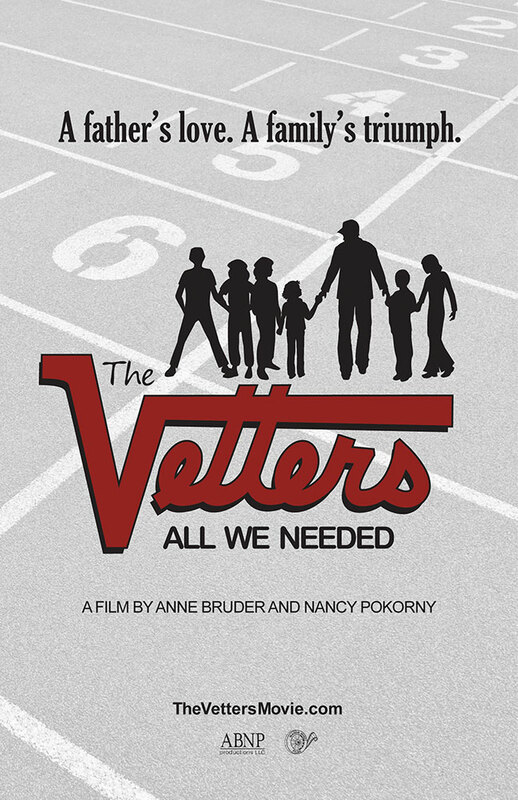 Subsequently, the release of independent feature documentary THE VETTERS: ALL WE NEEDED in 2013 was the culmination of six years of producing, directing, filming, scoring and editing – all performed by Anne with help from Nancy. While informally studying film and drama for many years as a natural interest, Anne is self-taught in camera operation, script development, production, editing, sound engineering, and scoring. In addition to co-producing her own independent documentaries, Anne helps nonprofit organizations communicate and promote their causes through creative video production. Anne grew up in Avon, Ohio on the original piece of property first purchased by her great, great grandfather when he emigrated from Germany in 1853. Nancy Pokorny grew up in rural Chardon, Ohio where she first embarked on a highly successful sports career winning All-State honors in cross country, basketball and track & field. It was here that Nancy became a close friend of the Vetter family, the subjects of the film THE VETTERS: ALL WE NEEDED. As a member of the famed Blue Ribbon Track Club, Nancy had the privilege to run with the world record-setting Vetters and learned a great deal of life’s lessons from this humble and authentic family. Nancy attended Slippery Rock University, achieving All-American honors in track & field and All-Eastern honors in cross country, as she teamed with best friend Juanita Vetter, who led Slippery Rock’s teams to national prominence. After graduating from Slippery Rock in 1984 as a mathematics major, Nancy taught high school mathematics and coached several championship track and field teams and individual state champions. She earned her Master’s Degree in Education from Kent State University, and in 1988, left teaching to work for a global HR consulting firm, Watson Wyatt (now Towers Watson), where she worked with Fortune 1000 corporations on both benefits and communications issues. A former Vice President of a nonprofit organization that focuses on the needs of small business (COSE), and a former Regional Sales Director with the world-renowned Cleveland Clinic, Nancy now is a Managing Consultant with a privately held HR consulting firm, Findley Davies. 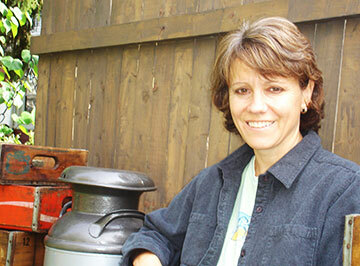 Nancy has co-owned Wagon Wheel Films with Anne Bruder since 2006, and co-produced the 2007 film Willoughby’s Legend & Legacy, a 30-minute documentary about the history of downtown Willoughby, Ohio. She attributes her interest in the arts to her family upbringing and fabulous arts and music education from Hambden Elementary School, Chardon Middle School and Chardon High School.